The town of Leende, in the Dutch province of North Brabant, makes for a beautiful rural holiday destination only 10 km away from the design city of Eindhoven. 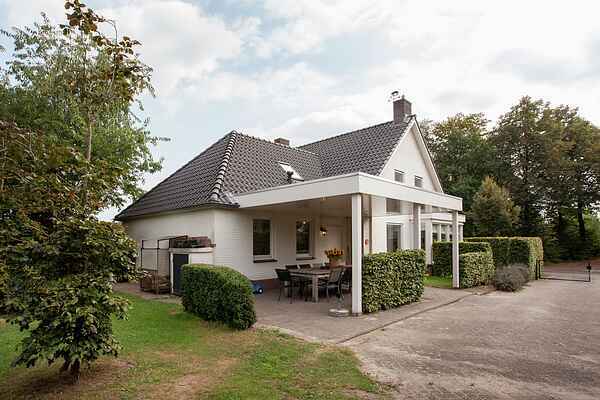 You'll be staying in a detached holiday home close to the 'Leenderbos'. Your patio offers you a beautiful view of the spacious lawn and the surrounding woodlands. There are two bedrooms, each with a double bed, and a bathroom on the ground floor. The kitchen takes you through to the spacious and pleasant living room. This room is lovely and bright. There are four more bedrooms, each suitable for two people, and a bathroom with shower and toilet, on the first floor of this group accommodation. The luxurious, covered veranda is a lovely place to sit and eat. The pleasant lawn has plenty of space for you to choose a nice spot for your sun bed. Sun or shade? It's up to you! Your house is in a great location. Nobody is overlooking you, apart from a curious cow in the adjacent meadow maybe. There are plenty of day trips to undertake in the area, such as a visit to the natural area of 'De Malpie', children's zoo 'Dierenrijk' in Mierloo, Zoo Veldhoven, 'SpaSense' spa and 'Toverland' amusement park. Nearby, in the 'Leenderbos', it's easy to spot a family of wild boars. Shush... don't be too noisy when you go exploring!